With the release of the discussion draft of the American Clean Energy and Security Act of 2009 colleagues have been asking an obvious question. If it were implemented, how much difference would it make? (1) What will this bill accomplish for US emissions reductions? Does it represent strong action? (2) What will this bill accomplish for global emissions and the long-term future? If you have a solid intuition about the climate system (and if you’ve been following the theme of other posts on this blog!) you’ll know that these are two different questions, with potentially very different answers. And a little more detail on how I calculated them. 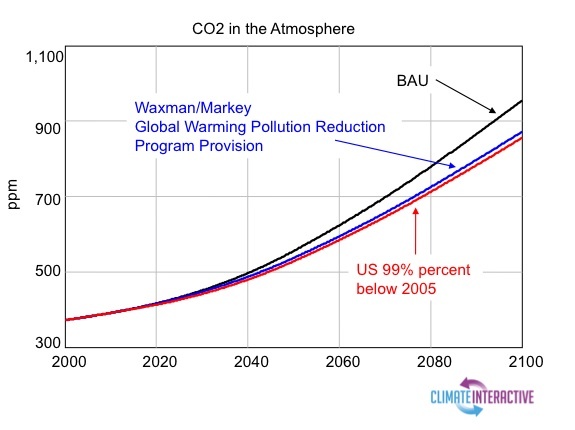 To estimate the long-term impact on CO2 levels I made two simplifying approximations. First of all I assumed that by reaching these targets, overall US emissions would fall to 85% of the targets set forth in the bill (since the bill focuses on activities that account for 85% of US emissions). And I used only the 2020 and 2050 targets, since the other targets (for 2012 and 2030) define points on a smooth trajectory. That result is shown in blue (compared to business as usual, in black, and an almost compete elimination of CO2 emissions, in red). Compare the blue line and the red line (almost complete elimination of US CO2 emissions) and you have a answer to the first question: is this a strong bill? Compare the blue line to the black line (business as usual) and you have an answer to the second question: what will this bill contribute to the long-term future for the climate? You can form your own conclusions on each of these questions. But whether you view this bill a strong or not, these results make one fact very clear. If we frame the US contribution to ‘solving’ climate change as a matter of domestic emissions reductions we are limiting our ability to make a contribution. We can reduce our own emissions very significantly and unless we also help create the conditions where developing nations can achieve low-carbon development, CO2 targets for 350 or 450 ppm will remain out of reach, for all of us. And so the greatest strength in this bill, were it to be implemented, might not be in tons of carbon not emitted in the US, but in doors opened in international dialog and cooperation. There have to be more -and productive- conversations amongst different stakeholders in a larger scale (reaching out certain regions, countries or economic areas). There are more opportunities then yet sense and see and human kind has a creativity most of us can’t even imagine in our present situation (especially when working together across boundaries:-)).